Bringing people of all ages together through performance, international festivals, educational experiences and outreach programs. The goal of the San Francisco International Music Festival (sfmf) is to preserve the art form of piano duo by bringing people of all ages together through performance, international festivals, educational experiences and outreach programs. Celebrating its 11th year, sfmf sponsors The Milton & Peggy Salkind International Piano Duo Festival, which is the United States’ first and foremost international music festival solely dedicated to the art of piano duo. Sfmf is proud to present the 5th season of this unique piano duo concert series that captures the spirit of the region that originally inspired the creation of the festival in the United States. 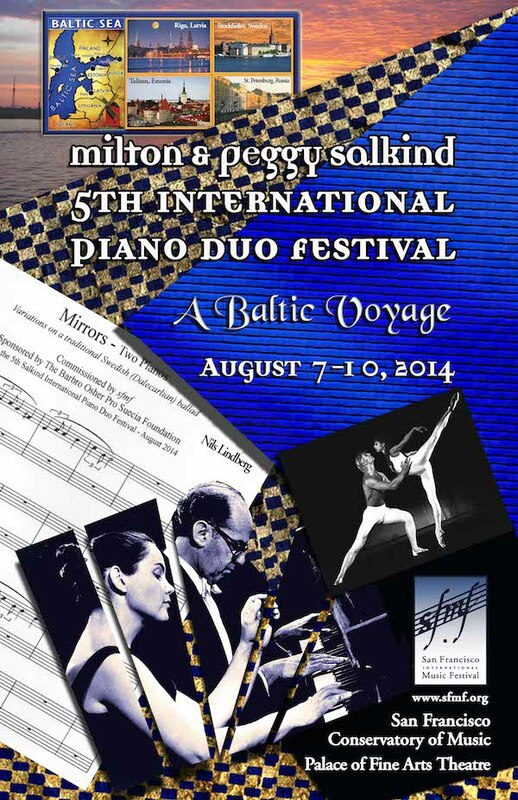 The 5th Salkind Festival (August 7-10, 2014) featured A Baltic Voyage, which showcased the rich musical heritage of the countries that border the Baltic Sea - Russia, Latvia, Estonia, Lithuania, Sweden, Finland, Denmark, Poland and Germany. 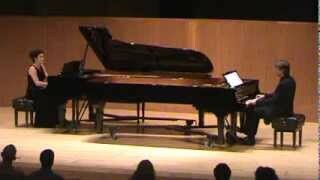 One of the composers highlighted at the 2014 Salkind Festival was Egils Straume from Latvia. Sfmf co-founders, Catherine & Anthony Angelo are currently working on a collaborative project with the Latvian composer. The Angelos were introduced to Straume’s music in 2007 by the distinguished Latvian pianist, Raffi Kharajanyan and have since performed his music in the U.S. and in Russia. The upcoming performance project will feature Straume's works in two concerts: 8:00 p.m., September 29, (Napa Valley Opera House,) and 8:00 p.m., September 30, (San Francisco Conservatory of Music). The program will include four world premieres and several American premieres. 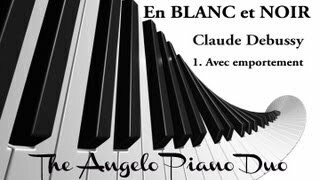 The Angelo Duo will join with woodwind artist Richard Mathias to perform two works: "In Memoriam" for piano duo and alto sax and "Composition for Block Flute & Piano Duo," which will be an American premiere. 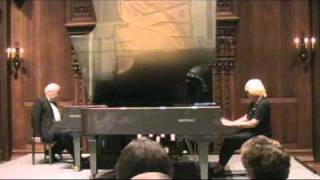 Leanne Rees, an American pianist and composer attended one of the concerts that featured Straume’s composition, "Variations on a Latvian Folk Song." 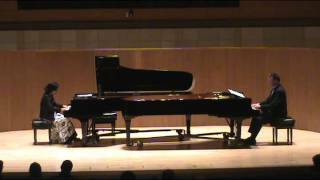 She was so inspired by Straume’s music that she contacted him to commission a new work for two pianos. Leanne has been working with Straume for the past year on a collaborative project, which will be presented in the two upcoming concerts in the Bay Area. 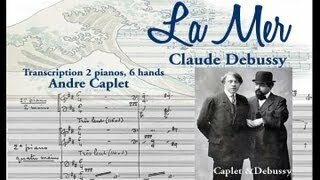 The program will feature four world premieres and one American premiere of Straume’s compositions. The artists include Leanne Rees and Egils Straume Piano Duo, The Angelo Piano Duo, Richard Mathias, saxophone and block flute, and the Grammy Award winning clarinetist, Eddie Daniels performing Straume’s Clarinet Concerto with Bernard Rubenstein conducting the Hollywood Chamber Orchestra. 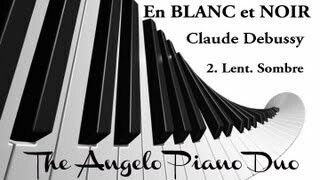 Duo Turgeon - Guastavino "Tres Romances Argentinos"
Anderson & Roe - Villa-Lobos "Bachianas Brasileiras No. 5 - Aria"